Sometimes as we jump from topic to topic it can be easy for students to see science as a series of endless disconnected facts. Each fact on their own is interesting, but together they represent an overwhelming barrage of information that novices must learn. The expert in contrast has managed to organise all this knowledge into fruitful schemata, based on conceptual principles not salient to the novice. As the expert experiences the intellectual satisfaction of making links, the novice is feeling frustrated and about to give up. The expert has constructed a conceptual framework of big ideas, the novice hasn’t. Big ideas of Science Education were published by Wynne Harlen and others in 2010. These ideas distil down scientific knowledge into ten guiding principles that we can use to explain a diversity of scientific phenomena. The big ideas are lenses by which we can make sense of the world – an important goal for science education. How can we help our students construct their own ‘lenses’ that hopefully will resemble those described by Harlen? Attempts to re-design the science curriculum to better emulate the big ideas is probably not going to work. Firstly, we can’t teach big ideas directly as they are a product of understanding many different concepts from different topics. 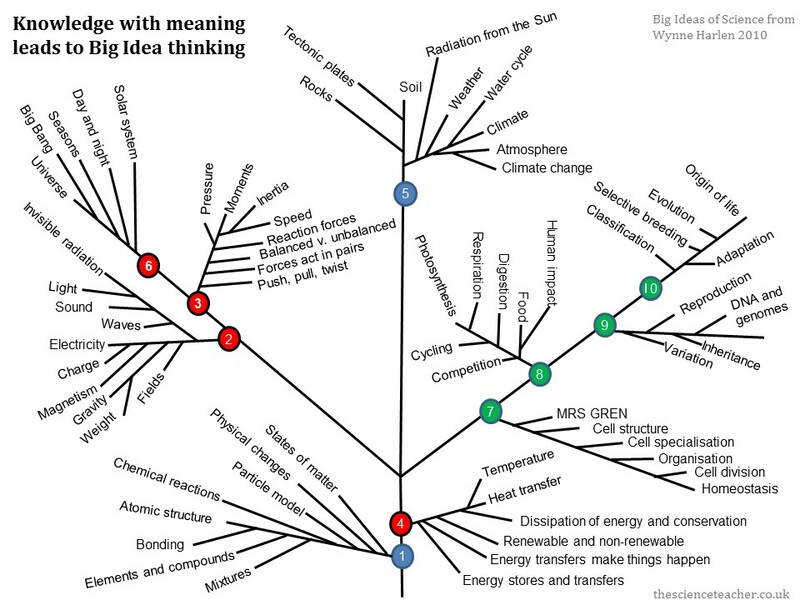 You can see this in the tree diagram I’ve made, where an understanding of big idea one is reliant on knowledge from many different topics – we must work from the tips of the tree backwards until understanding coalesces at the big idea itself. Secondly, there are some good utilitarian reasons why science is arranged into different disciplines and not big ideas. It allows books, departments and journals to be structured to facilitate retrieval of information. It allows individuals and organisations to achieve expertise and it also helps us organise knowledge into discrete units that can be more easily learnt and understood. Big idea thinking then is the goal, it’s just we can’t teach it directly, but surely we can help students get there faster?! How can we encourage big idea thinking? Use low stakes formative quizzing to help students learn knowledge so that they have more capacity to make connections between different topics. Encourage students to make links and identify significant aspects when solving problems by creating tasks with clearly defined success criteria that specifically encourage use of big idea thinking. Let students know what big idea their current topic belongs to. Use big ideas to recap what prior knowledge students have already before teaching a new topic. Design a curriculum to ensure concepts from each big idea are revisited regularly and build overtime. Don’t crowd the curriculum. Create tasks and assessments that require students to use big idea thinking to explain concepts. Atoms are the building blocks of all matter, living and non-living. The behaviour and arrangement of atoms explains the properties of different materials. In chemical reactions atoms are rearranged to form new substances. Each atom has a nucleus containing neutrons and protons, surrounded by electrons. The opposite electric charges of protons and electrons attract each other, keeping atoms together and accounting for the formation of some compounds. All objects have an effect on other objects without being in contact with them. In some cases the effect travels from the source to the receiver in the form of radiation (e.g. visible light). In other cases, action at a distance is explained in terms of the existence of a field of influence between objects, such as a magnetic, electric or gravitational field. Gravity is a universal force of attraction between all objects, however large or small. It keeps the planets in orbit around the sun and causes terrestrial objects to fall towards the centre of the earth. A force acting on an object is not seen directly but is detected by its effect on the object’s motion or shape. If an object is not moving, the forces acting on it are equal in size and opposite in direction, balancing each other. Since gravity affects all objects on earth there is always another force opposing gravity when an object is at rest. Unbalanced forces cause a change in movement in the direction of the net force. When opposing forces acting on an object are not in the same line they cause the object to turn or twist. This effect is used in some simple machines. Many processes or events involve changes and require an energy source to make them happen. Energy can be transferred from one body or group of bodies to another in various ways. In these processes some energy becomes less easy to use. Energy cannot be created or destroyed. Once energy has been released by burning a fossil fuel with oxygen, some of it is no longer available in a form that is as convenient to use. Radiation from the sun heats the earth’s surface and causes convection currents in the air and oceans, creating climates. Below the surface, heat from the earth’s interior causes movement in the molten rock. This leads to movement of the plates that form the earth’s crust, creating volcanoes and earthquakes. The solid surface is constantly changing through the formation and weathering of rock. The solar system comprises the sun and the eight planets and other smaller objects orbiting it. Day and night and the seasons are explained by the orientation and rotation of the earth as it moves round the sun. The solar system is part of a galaxy of stars, gas and dust, one of many billions in the universe, enormous distances apart. Many stars appear to have planets. All organisms comprise one or more cells. Multi-cellular organisms have cells that are differentiated according to their function. All the basic functions of life are the result of what happens inside the cells that make up an organism. Growth is the result of multiple cell divisions. Food provides materials and energy for organisms to carry out the basic functions of life and to grow. Green plants and some bacteria are able to use energy from the sun to generate complex food molecules. Animals obtain energy by breaking down complex food molecules and ultimately depend on green plants as their source of energy source. In any ecosystem there is competition among species for the energy resources and materials they need to live and reproduce. Genetic information in a cell is held in the chemical DNA. Genes determine the development and structure of organisms. In asexual reproduction all the genes in the offspring come from one parent. In sexual reproduction half of the genes come from each parent. All life is directly descended from a universal common ancestor that was a simple one-celled organism. Over countless generations changes resulting from natural diversity within a species led to the selection of individuals best suited to survive under certain conditions. Species not able to respond sufficiently to changes in their environment become extinct. 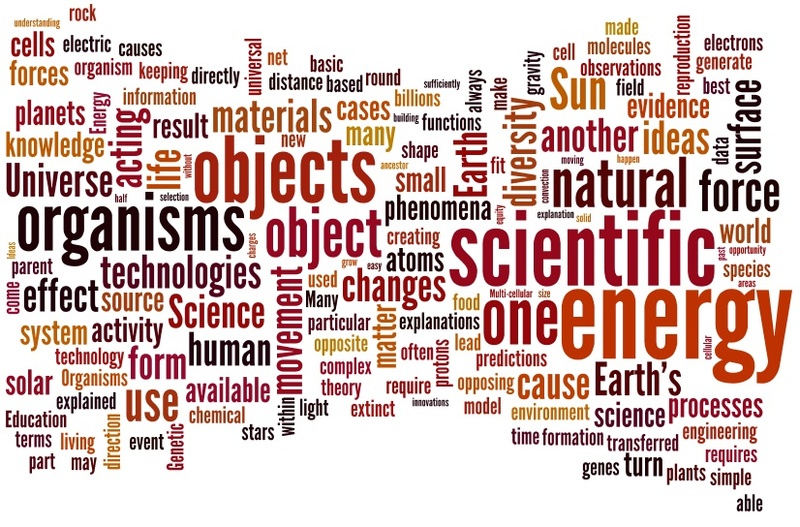 Science is a search to explain and understand phenomena in the natural world. There is no single scientific method for doing this; the diversity of natural phenomena requires a diversity of methods and instruments to generate and test scientific explanations. Often an explanation derives from the factors that must be present for an event to take place, as shown by evidence from observations and experiments. In other cases, supporting evidence is based on correlations revealed by patterns in systematic observation. A scientific theory or model representing relationships between variables of a natural phenomenon must fit the observations available at the time, and lead to predictions that can be tested. Any theory or model is provisional and subject to revision in the light of new data, even though it may have led to predictions that accord with data in the past. The use of scientific ideas in engineering and technologies has made considerable changes in many aspects of human activity. Advances in technologies enable further scientific activity; in turn this increases understanding of the natural world. In some areas of human activity, technology is ahead of scientific ideas. In other areas, scientific ideas precede technology. The use of scientific knowledge in technologies makes many innovation possible. Whether or not particular applications of science are desirable is a matter that cannot be addressed using scientific knowledge alone. Ethical and moral judgments may be needed, based on such considerations as justice or equity, human safety, and impacts on people and the environment. Carey, S., (1986). Cognitive science and science education. American Psychologist, 41(10), p.1123. Harlen, W. (Ed.). (2015). Working with big ideas of science education. Association for Science Education. Harlen, W. (Ed.). (2010). Principles and big ideas of science education. Association for Science Education.